There's a new Lumia smartphone in town and it is the most affordable member of the series to date. Microsoft will be launching the just-announced Lumia 430 for only $70 before taxes and subsidies – a move meant to bring popular apps and Microsoft's services to a broader audience. Now, you're probably thinking that a $70 smartphone doesn't really have much to shine with in terms of specs. And you'd be right if you do as the Microsoft Lumia 430 has "low-end" written all over it. The smartphone packs a 4-inch display with 480 by 800 pixels of resolution, a dual-core Snapdragon 200 SoC running at up to 1.2GHz, 1GB of RAM, and 8GB of expandable storage. The main, fixed-focus camera has just 2MP of resolution, while the front-facing cam shoots 640 by 480-pixel images. The dual SIM functionality is welcome as it enables one to use two carriers' services on one device. All in all, a modest hardware configuration, but actually decent given the phone's price point. Windows Phone is known for running well even on low-end devices, and the 1GB of RAM should suffice for all the apps available on the Windows Phone Marketplace. 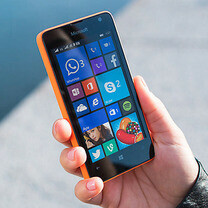 Speaking of software, the Microsoft Lumia 430 will ship with Windows Phone 8.1 along with the Denim update. Later on, the smartphone will be treated to an update to Windows 10 for Phones. Users of the Lumia 430 will get to enjoy Microsoft's array of pre-loaded apps, including Skype for IMs, voice chats, and video calls, Microsoft Office for handling documents on the go, and OneDrive with up to 30GB of free cloud storage. Furthermore, hit games like Candy Crush Saga and Minecraft Pocket Edition will be playable on the device. Expect seeing the Microsoft Lumia 430 on shelves in April, when the phone is projected to launch in India, Russia, Kazakhstan, Ukraine and Belarus, as well as in parts of Pacific Asia and the Middle East. You'll be allowed to have yours in any color, as long as it is black or orange. snapdragon 200? I think this phone is like a car that use motor bike engine. (or perhaps tata nano) I wonder if Blackberry should follow Microsoft on how low can you go to gain more user. Yes, the Moto E is $120. ... and the third world people, poor people and the like. if it release in my country, i'll consider buying one. I think this is a perfect example of how a low end device can also help people who have less disposable income with a fine device without too much compromises. $70 android phones are very laggy (galaxy star user) and it takes too much patience to use them! This is truely a great alternative! TLies. I use a 512mb RAM, 2GB internal storage Neptune Pines smart watch. Its good with WhatApp, Facebook and YouTube. No issue. Moto E is also a viable choice for the same price. Don't knock off other brands and choices. Buyer are smart to make their own choices. You twisting with unconfirmed information. That is phone will be getting WP10. But i am sharing fact that low end device can run all android social app without problem. Many of those app have yet to hit the WP platform. This is another important consideration for most buyers. So $50 more for the 3g variant...so it is not 'the same price'. And if you go for the LTE variant your spending 150. So a 640 would match right up against it and imo even outrun it. After pitting the 640 side by side other devices during the testing phase here, its a really good phone and the 8mp shots are rather impressive and the rich capture is amazingly fast. Plus it has a larger screen and higher resolution for approximately the same price. Personally I'd rather get a Lumia 525 than this, even if I have to let go of the front-facing camera & dual SIM. Krait ftw!!! I guess Microsoft's next phone will be a couple of cans joined by a piece of string.